Stringer & MMJ Services Broadcast news is our forte. 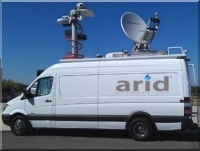 ARID PRODUCTIONS Provides broadcast quality motion video and still image photography of breaking news events covering all of the USA with a specific focus on the state of Arizona. We have provided site video for accident research and incident investigators, or event and scene documentation for insurance agencies. We’ve also provided television, cable, and video production services for various live and taped events like documentaries, press conferences, video press releases, fashion shows, industry/trade seminars, educational, instructional, Fire EMS and public safety training videos, sporting events and fund-raisers at some of the Phoenix areas top venues. Our crews are available at a moments notice 24 hours a day, 7 days a week and will travel anywhere within the United States. Our average turnaround time from end of shoot to delivery to you, is 30 minutes. We use only the highest quality and most advanced ENG equipment. We also take an enormous amount of pride in our outstanding working relationship with local PIO's and public service agencies. If its a live production you need, we can do it.